Synopsis: Meet Sergeant Sousuke Sagara, a 17-year old soldier in the military organization Mithril, and Kaname Chidori, your average high school student who also happens to be one of the "Whispered", a group of people endowed with knowledge about top-secret technology. Following the Tuatha de Danaan's seajacking incident, things are back to normal at Jindai High School in Tokyo, or as normal as they get with Sousuke guarding Kaname. After finding out who betrayed Mithril and caused the seajacking incident, Kurz and Mao are sent on a top secret mission in order to capture and bring the traitor back. But when they run into problems during their mission, will even Sousuke be able to help them out? 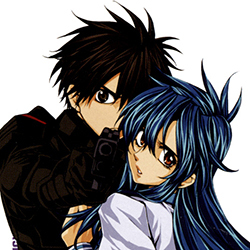 A thrilling car chase begins a yet another exciting saga in the Full Metal Panic story. Full Metal Panic: Sigma follows the novel, End of Day By Day and the recently released season of Full Metal Panic: The Second Raid.